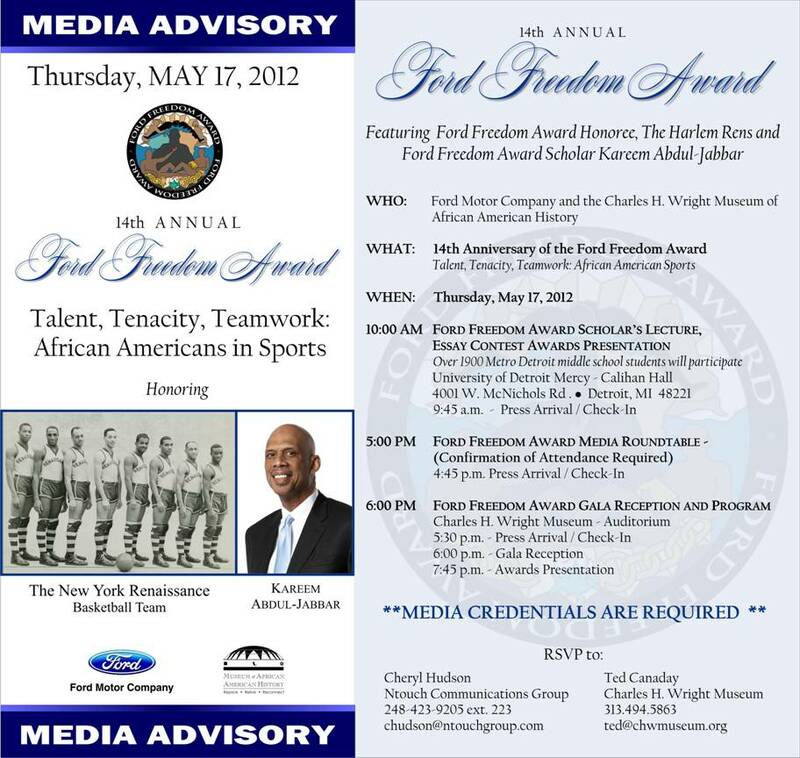 The New York Renaissance “Harlem Rens” basketball team and all-time NBA leading scorer Kareem Abdul-Jabbar will be honored for their talent, tenacity and teamwork in sports at the 14th Annual Ford Freedom Award on May 17. The 2012 Ford Freedom Award Honoree is the Harlem Rens basketball team, which was the first all-black, African American-owned pro basketball team. Known as one of the dominant basketball teams of the 1920s and ’30s, the Harlem Rens also was the first basketball team to win a world championship in 1939. The Ford Freedom Awards program recognizes two recipients each year. The Ford Freedom Award Honoree is presented posthumously to a distinguished African American who dedicated his or her life to improving the African American community and the world at large through that individual’s chosen field (such as arts, humanities, religion, business, politics, sports, science or entertainment). The Ford Freedom Awards Scholar is an African American who has excelled on a national or international level in the same field as the Ford Freedom Award Honoree. The Scholar serves as a living legacy, carrying forth the ideals of the Honoree and furthering those achievements for a new generation. The Charles H. Wright Museum of African American History, in partnership with Ford Motor Company, launched the Ford Freedom Award program in 1999 to create a forum for celebrating and recognizing individuals whose achievements brought forth lasting and positive change for African Americans and the world. In addition to the evening gala, the Ford Freedom Award program includes a statewide essay contest for grades four through eight, which this year drew more than 1,900 submissions. The Ford Freedom Award program is made possible by a grant from Ford Motor Company, and is an annual fundraiser for the Charles H. Wright Museum of African American History. Additional major sponsors of the Ford Freedom Award include McDonald’s Owners of Southeast Michigan, and MGM Grand Detroit. For additional event information regarding sponsorship opportunities and tickets, call (313) 494-5800 or visit www.fordfreedomaward.com.